Many people have a problem with letting go of the past – whether painful or pleasant. Not me. I’ve always been able to let go of the past almost immediately. I’ve had a problem letting go of the future. Ever since my first job I’ve been a planner. I’ve been able to see and develop pathways to future goals, and in many cases that has served me well. Over time, especially as professional responsibilities increased, the level and detail of planning increased. When I was faced with a chaotic family medical situation for a few years, the level of planning reached past obsessive levels. I would literally have future plans laid out in excruciating detail, with contingency plans A, B, C and D for each potential branch of the path. I spent hours each day thinking about plans, tweaking strategies and tactics, personally and professionally. I spent hours identifying potential corrective actions to situations that, if even the worst occurred, might take a few minutes to fix… if it was even worth fixing. Some folks know I’m still that way about travel, and before even simple trips I meticulously plan the right combination of flights that have the highest historical on-time percentages with the right layover time buffers through the cities with the best weather. I’ve memorized terminal maps, airline club locations, best seats on different aircraft types, and frequent flyer rules. Crazy? Perhaps. But I haven’t experienced a flight disruption in several years – and I’m a Star Alliance million miler and have been to over 60 countries. I blame it on my first boss who told me to “sweat the details.” That simple statement apparently triggered some OCD-inducing neurochemical pathway. So before you tell me that I need to check myself in to a facility, let me tell you that I’ve changed. The change began a few years ago (surprisingly without professional intervention) by the Lean guy in me realizing it was a little ridiculous to spend more time planning contingencies than it would take to simply deal with the problem – if it even occurred. Waste. This was a struggle. I had to be ok with problems arising. I soon learned that, as the cliché states, problems are opportunities to learn. The change was fortified by the realization that I was missing what was happening in the present by focusing so much on the future. Time had flown by and I hadn’t even noticed. I had experienced many great things, but I didn’t remember them. I remember one day when I was standing in the middle of our production floor, trying to channel Taiichi Ohno and simply observe the process. After nearly an hour I realized I had noticed an issue in the first five minutes and my mind had spent the next fifty-five minutes thinking about solutions. I completely missed that the production team had also seen the problem and had already resolved it. Space case. Time to work on focus, on being present. Coincidentally it was about this same time that I started to discover and explore the remarkable nexus between Lean and Zen. The emphasis on the present moment is perhaps Zen’s most distinctive characteristic. In our western relationship with time, in which we compulsively pick over the past in order to learn lessons from it, and then project into a hypothetical future in which those lessons can be applied, the present moment has been compressed to a tiny sliver on the clock face between a vast past and an infinite future. Zen, more than anything else, is about reclaiming and expanding the present moment. There are many exercises that can help us become more present. I won’t expound on those here, but simply say that by turning off the radio in the car, deliberately trying to experience each of the five senses while walking, and spending time alone in silence, you can slowly learn to be more aware. So as we reach the end of the year, an arbitrary time when many of us contemplate the past and plan for the future, don’t forget the present. Learn from the past and move on. Think about what level of planning is really necessary – and value-added – for the future. Then return to the present, the gemba, and experience life where it is truly happening. Relish the smell of the roses. Good article. There is a saying attributed to Eisenhower, “Planning is everything, plans are useless.” When away from the gemba, planning contingencies and thinking ahead is key. 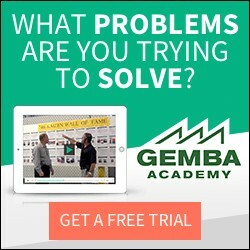 When on the gemba, it is important to observe how “the plan” is doing, and make any adjustments based on the contingencies that you thought through previously (“the planning”).